Family Guy Three Dee Junior T-Shirt - This is an officially licensed Family Guy t-shirt from the hit animated tv show, the Family Guy featuring Stewie playing video games. This tee shirt makes a perfect gift for any Family Guy fan which features Stewie. Family Guy Stewie Griffin t-shirt color is as shown. All of our Family Guy t-shirts not only look and feel great, but these tees are made to last. 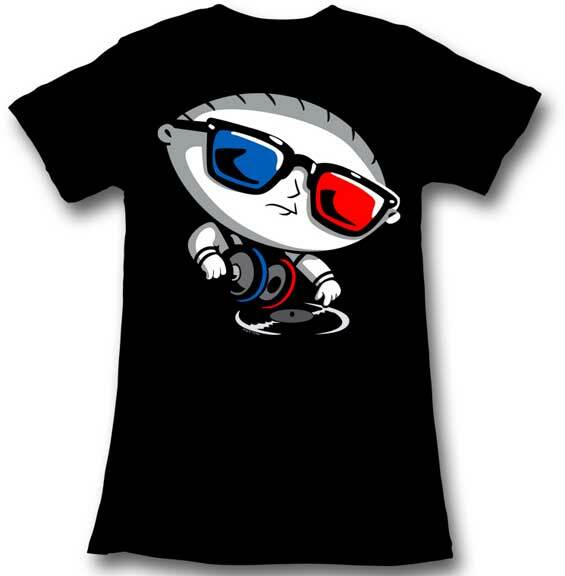 Our Family Guy Stewie Griffin t-shirt is officially licensed and made of 100% cotton. If you have questions regarding our Family Guy Stewie Griffin 3D t-shirt or any of our other tv show and cartoon merchandise, please email us with the product name and number.